This entry begins by describing the nature of rights: their classification, their composition, and their function. It then reviews the history of the language of rights, and various relationships between rights and reasons. The major contemporary philosophical approaches to the justification of rights are compared, and the entry concludes by surveying criticisms of rights and “rights talk.” The focus throughout is on general theoretical issues instead of on the analysis or justification of specific rights. Those looking for a book-length introduction to rights may consider Jones (1994), Edmundson (2004), Campbell (2006) and Ivison (2007). A right to life, a right to choose; a right to vote, to work, to strike; a right to one phone call, to dissolve parliament, to operate a forklift, to asylum, to equal treatment before the law, to feel proud of what one has done; a right to exist, to sentence an offender to death, to launch a nuclear first strike, to castle kingside, to a distinct genetic identity; a right to believe one's eyes, to pronounce the couple husband and wife, to be left alone, to go to hell in one's own way. Who is alleged to have the right: Children's rights, animal rights, workers' rights, states' rights, the rights of peoples. What actions or states or objects the asserted right pertains to: Rights of free expression, to pass judgment; rights of privacy, to remain silent; property rights, bodily rights. Why the rightholder (allegedly) has the right: Moral rights are grounded in moral reasons, legal rights derive from the laws of the society, customary rights exist by local convention. How the asserted right can be affected by the rightholder's actions: The inalienable right to life, the forfeitable right to liberty, and the waivable right that a promise be kept. Many of these categories have sub-categories. For instance, natural rights are the sub-class of moral rights that humans have because of their nature. Or again, the rights of political speech are a subclass of the rights of free expression. Categorization sorts the profusion of rights assertions. To understand the exact meaning of any assertion of a right, we need to understand more precisely how rights are constructed and what they do. An analysis of rights has two parts: a description of the internal structure of rights (their form), and a description of what rights do for those who hold them (their function). The Hohfeldian system for describing the form of rights is widely accepted, although there are scholarly quarrels about its details. Which theory gives the best account of the function of rights has been much more contentious; we turn to that debate in section 3. Analysis reveals that most familiar rights, such as the right to free expression or the right of private property, have a complex internal structure. Such rights are ordered arrangements of basic components, much in the same way that most molecules are ordered arrangements of chemical elements. The four basic components of rights are known as “the Hohfeldian incidents” after Wesley Hohfeld (1879–1918), the American legal theorist who discovered them. These four basic “elements” are the privilege, the claim, the power, and the immunity. Each of these Hohfeldian incidents has a distinctive logical form, and the incidents fit together in characteristic ways to create complex “molecular” rights. A has a privilege to φ if and only if A has no duty not to φ. To say that you have a right to pick up the shell is to say that you have no duty not to pick it up. You will not be violating any duty not to pick up the shell should you decide to do so. Similarly your right to sit in an empty seat in the cinema, and your right to paint your bedroom red, are also privileges. Privilege-rights mark out what their bearer has no duty not to do. When a US President invokes “executive privilege” to resist an assertion that he has a duty not to conceal evidence, he is invoking a Hohfeldian privilege. Similarly, a license (to drive, to perform surgery, to kill) endows its holder with a privilege to engage in the licensed activity. A has a claim that B φ if and only if B has a duty to A to φ. The employee has a claim that the employer pays him his wages, which means that the employer has a duty to the employee to pay those wages. As seen in the definition and the example, every claim-right correlates to a duty in (at least) one duty-bearer. What is distinctive about the claim-right is that a duty-bearer's duty is “directed at” or “owed to” the right-holder. Not all claim-rights are created by voluntary actions like signing a contract; and not all claim-rights correspond to duties in just one agent. For example, a child's claim-right against abuse exists independently of anyone's actions, and the child's claim-right correlates to a duty in every other person not to abuse her. This example of the child's right also illustrates how a claim-right can require duty-bearers to refrain from performing some action (i.e., that “phi” can be a negative verb such as “not abuse her”). Privileges and claims define what Hart called “primary rules”: rules requiring that people perform or refrain from performing particular actions (Hart 1961). Indeed the primary rules for all physical actions are properly analyzed as privileges and claims. Were we to know all the privileges and claims that there are regarding physical actions, we would know for every possible physical action whether that action was permitted, required or forbidden. Two further Hohfeldian incidents define what Hart called “secondary rules”: rules that specify how agents can introduce, change, and alter primary rules. A has a power if and only if A has the ability within a set of rules to alter her own or another's Hohfeldian incidents. A ship's captain has the power-right to order a midshipman to scrub the deck. The captain's exercise of this power changes the sailor's normative situation: it imposes a new duty upon him and so annuls one of his Hohfeldian privileges (not to scrub the deck). Similarly, a promisor exercises a power-right to create in the promisee a claim that the promisor will perform a certain action. The promisor's exercise of her power-right to promise creates in the promisee a claim that the promisor do what she promised to do. Or again, a neighbor waives his claim that you not enter his property by inviting you into his home. Ordering, promising, waiving, sentencing, buying, selling, and abandoning are all examples of acts by which a rightholder exercises a power to change his own Hohfeldian incidents or those of another. Powers can alter not only “first-order” privileges and claims, but “second-order” incidents as well (Sumner 1987, 31). An admiral, for example, has the power-right to relieve a captain of her power-right to command a ship. Rights to alter the authority of others are, as we will see, definitive of all developed legal and political systems. B has an immunity if and only if A lacks the ability within a set of rules to alter B's Hohfeldian incidents. The United States Congress lacks the ability within the Constitution to impose upon American citizens a duty to kneel daily before a cross. Since the Congress lacks a power, the citizens have an immunity. This immunity is a core element of an American citizen's right to religious freedom. Similarly, witnesses in court have a right not to be ordered to incriminate themselves, and civil servants have a right not to be dismissed after a new government comes to power. All of these rights are immunities, corresponding to an absence of a power in some other party to alter the rightholder's normative situation in some way. Hohfeld arranged the four incidents in tables of “opposites” and “correlatives” so as to display the logical structure of his system. In order to fill out the tables he added some further terminology. For instance, if a person A has a claim, then A lacks a “no-claim” (a no-claim is the opposite of a claim). And if a person A has a power, then some person B has a “liability” (a liability is the correlative of a power). If A has a Claim, then A lacks a No-claim. If A has a Claim, then some person B has a Duty. In the figure, the “first-order” rights are your legal rights directly over your property—in this case, your computer. The privilege on this first level entitles you to use your computer. The claim correlates to a duty in every other person not to use your computer. The “second-order” rights are your legal rights concerning the alteration of these first-order rights. You have several powers with respect to your claim—you may waive the claim (granting others permission to touch the computer), annul the claim (abandoning the computer as your property), or transfer the claim (making the computer into someone else's property). Also on the second order, your immunity prevents others from altering your first-order claim over your computer. 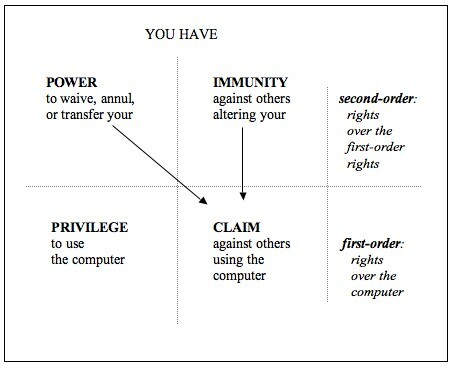 Your immunity, that is, prevents others from waiving, annulling, or transferring your claim over your computer. The four incidents together constitute a significant portion of your property right. Of course all of these incidents are qualified: you have no privilege to strike others with your computer, or to use your computer to hack into someone else's machine; and your immunity may not entirely block out the state's power of expropriation (if for example the computer becomes evidence in a criminal case). These qualifications to the incidents carve the contours of your property right, but they do not affect its basic shape. There may also be more incidents associated with ownership than shown in the figure above. Wellman (1985, 1995) describes each right as having a “defining core” surrounded by “associated elements” which may be present or absent in a particular case. Your property right, for instance, may also be protected by a qualified third-order immunity against the government altering your second-order rights over your property (for example, under the “Takings Clause” of the Fifth Amendment to the US Constitution the government cannot simply annul your right to sell a parcel of your land). The distinction between active and passive rights (Lyons 1970) maps neatly onto the Hohfeldian incidents. The privilege and the power are “active” rights that concern their holders' own actions. The claim and the immunity are “passive” rights that regulate the actions of others. Active rights are signaled by statements of the form “A has a right to φ”; while passive rights are signaled by statements of the form “A has a right that B φ” (in both of these formulas, “φ” is an active verb). A naval captain has an active privilege-right to walk the decks and an active power-right to order that the ship set sail. A player in a chess tournament has a passive claim-right that his opponent not distract him, and a professor has a passive immunity-right that her university not fire her for publishing unpopular views. A distinction between negative and positive rights is popular among some normative theorists, especially those with a bent toward libertarianism. The holder of a negative right is entitled to non-interference, while the holder of a positive right is entitled to provision of some good or service. A right against assault is a classic example of a negative right, while a right to welfare assistance is a prototypical positive right (Narveson 2001). Since both negative and positive rights are passive rights, some rights are neither negative nor positive. Privileges and powers cannot be negative rights; and privileges, powers, and immunities cannot be positive rights. The (privilege-) right to enter a building, and the (power-) right to enter into a binding agreement, are neither negative nor positive. It is sometimes said that negative rights are easier to satisfy than positive rights. Negative rights can be respected simply by each person refraining from interfering with each other, while it may be difficult or even impossible to fulfill everyone's positive rights if the sum of people's claims outstrips the resources available. However, when it comes to the enforcement of rights, this difference disappears. Funding a legal system that enforces citizens' negative rights against assault may require more resources than funding a welfare system that realizes citizens' positive rights to assistance. As Holmes and Sunstein (1999, 43) put it, in the context of citizens' rights to state enforcement, all rights are positive. Moreover, the point is often made that the moral urgency of securing positive rights may be just as great as the moral urgency of securing negative rights (Shue 1996). Whatever is the justificatory basis for ascribing rights—autonomy, need, or something else—there might be just as strong a moral case for fulfilling a person's right to adequate nutrition as there is for protecting that person's right not to be assaulted. All rights can be represented by Hohfeldian diagrams like the diagram of the part of the property right “molecule” above. However, some diagrams of Hohfeldian incidents that we could construct do not correspond to any right. Rights are only those collections of Hohfeldian incidents that have a certain function (or perhaps certain functions). To take an analogy: all thrones are chairs, but only chairs with a certain function are thrones. At first this survey might remind one the proverb of the blind men and the elephant. However, we should distinguish between two different aims that a theorist might have when he make a statement of the form “All rights are x.” A theorist may be attempting to analyze the meaning of our ordinary concept of rights, or he may be stipulating a definition of “rights” within his own ethical, political or legal theory. Mill's statement is better seen as a stipulative definition of the term “right.” Mill stipulates this particular definition because the concept of “those possessive relations that are valuable enough that it is worthwhile for society to institute sanctions to protect them” is a concept that works well within his larger utilitarian theory. So where Mill's statement departs from the common understanding of rights, we should charitably read Mill as prescribing, instead of describing, usage. Many authors' pronouncements about rights are charitably interpreted as these kinds of exercises in stipulation, rather than as attempts to analyze the ordinary concept of rights. In the scholarly literature it is not uncommon to encounter a general statement about rights aligned with Hohfeld's assertion in the list above: that all rights are, or at least include, claim-rights (see, e.g., Raz 1986, 166, 173–75; Steiner, 1994, 55; Kramer, Steiner and Simmonds 1999, 9–14). Again these “rights are claims” statements are better interpreted as stipulative, rather than as analyzing common usage. “Rights are claims” positions cannot recognize, for example, rights in a Hobbesian state of nature where each person has unlimited privileges of self-defense. Neither could a “rights are claims” theory recognize rights in a section of a political constitution comprising only the powers of various office-holders to appoint to other political offices. The statement that rights are claims is prescriptive for, not descriptive of, usage. There are two main theories of the function of rights: the will theory and the interest theory. Each presents itself as capturing an ordinary understanding of what rights do for those who hold them. Which theory offers the better account of the functions of rights has been the subject of spirited dispute, literally for ages. Will theorists maintain that a right makes the rightholder “a small scale sovereign.” (Hart 1982, 183) More specifically, a will theorist asserts that the function of a right is to give its holder control over another's duty. Your property right diagrammed in the figure above is a right because it contains a power to waive (or annul, or transfer) others' duties. You are the “sovereign” of your computer, in that you may permit others to touch it or not at your discretion. Similarly a promisee is “sovereign” over the action of the promisor: she has a right because she has the power to waive (or annul) the promisor's duty to keep the promise. In Hohfeldian terms, will theorists assert that every right includes a Hohfeldian power over a claim. In colloquial terms, will theorists believe that all rights confer control over others' duties to act in particular ways. Interest theorists disagree. Interest theorists maintain that the function of a right is to further the right-holder's interests. An owner has a right, according to the interest theory, not because owners have choices, but because the ownership makes owners better off. A promisee has a right because promisees have some interest in the performance of the promise, or (alternatively) some interest in being able to form voluntary bonds with others. Rights, the interest theorist says, are the Hohfeldian incidents you have that are good for you. The contest between will-based and interest-based theories of the function of rights has been waged for hundreds of years. Influential will theorists include Kant, Savigny, Hart, Kelsen, Wellman, and Steiner. Important interest theorists include Bentham, Ihering, Austin, Lyons, MacCormick, Raz, and Kramer. Each theory has stronger and weaker aspects as an account of what rights do for rightholders. The will theory captures the powerful link between rights and normative control. To have a right is to have the ability to determine what others may and may not do, and so to exercise authority over a certain domain of affairs. The resonant connection between rights and authority (the authority to control what others may do) is for will theorists a matter of definition. However, the will theory's account of the function of rights is unable to explain many rights that most think there are. Within the will theory there can be no such thing as an unwaivable right: a right over which its holder has no power. Yet intuitively it would appear that unwaivable rights are some of the most important rights that we have: consider, for example, the unwaivable right not to be enslaved. (MacCormick 1977, 197) Moreover, since the will theorist holds that all rights confer sovereignty, he cannot acknowledge rights in beings incapable of exercising sovereignty. Within the will theory it is impossible for incompetents like infants, animals, and comatose adults to have rights. Yet we ordinarily would not doubt that these incompetents can have rights, for example the right not to be tortured. (MacCormick 1982, 154–66) Will theories also have difficulties explaining privilege-rights, which are not rights of authority over others. The interest theory is more capacious than the will theory. It can accept as rights both unwaivable rights (the possession of which may be good for their holders) and the rights of incompetents (who have interests that rights can protect). The interest theory also taps into the deeply plausible connection between holding rights and being better off. Will theorists and interest theorists have developed their positions with increasing technical sophistication. The issues that divide the two camps are clearly defined, and the debates between them are often intense. (Kramer, Simmonds, and Steiner 1998) The seemingly interminable debate between these two major theories has encouraged the development of alternative positions on the function of rights. “Demand” theories fill out the idea that, as Feinberg (1973, 58–59) puts it, “A right is something a man can stand on, something that can be demanded or insisted upon without embarrassment or shame.” For Darwall (2006, 18), to have a claim-right, “includes a second-personal authority to resist, complain, remonstrate, and perhaps use coercive measures of other kinds, including, perhaps, to gain compensation if the right is violated.” On Skorupski's account (2010, XII.6, XIV.2–3) rights specify what the right-holder may demand of others, where “demand” implies the permissibility of compelling performance or exacting compensation for non-performance. Like the will theory, such accounts center on the agency of the right-holder. They do not turn on the right-holder's power over the duty of another, so they do not share the will theory's difficulty with unwaivable rights. They may, however, have more difficulty explaining power-rights. Demand theories also share the will-theory's challenges in explaining the rights of incompetents, and in explaining privilege-rights. Other recent analyses of what rights do for rightholders attempt to combine the strengths of both of the leading theories. Sreenivasan (2005, 2010) puts forward a hybrid analysis of the claim-right that grafts the interest theory onto the will theory: here the function of the claim-right is to endow the right-holder with the amount of control over another's duty that advances her interests. Cruft (2004) suggests an inclusive analysis where all rights are “of value” in securing the right-holder's autonomy or interests. Wenar (2005) abandons the idea that all rights have any single function at all, describing instead several distinct functions that rights perform. Intellectual historians have tangled over the origins of rights. These debates are sometimes framed in terms of when “the concept of a right” emerged. Yet insofar as it is really the emergence of the concept of a right that is at issue, the answer lies beyond the competence of the intellectual historian and within the domain of the anthropologist. Even the most primitive social order must include rules specifying that certain individuals or groups have special permission to perform certain actions. Moreover, even the most rudimentary human communities must have rules specifying that some are entitled to tell others what they must do. Such rules ascribe rights. The genesis of the concept of a right was simultaneous with reflective awareness of certain social norms. The scholarly inquiry into when our modern, subjective sense of “a right” became established as a meaning of some word or phrase has proved long and divisive. The ancient authors often used words imprecisely, and smeared their meanings across and beyond the Hohfeldian categories. The intellectual historians themselves have occasionally congested the discussion by taking different features of rights as definitive of the modern concept. Moreover, the scholarly debate has sometimes accepted over-optimistic assumptions about the sharpness of conceptual boundaries. Nevertheless, two broad trends in the scholarly discussions are clear. The first is to push the origins of a term indicating a modern, subjective sense of “a right” back further into history: from Locke to Hobbes to Grotius in the seventeenth century, then to Gerson in the fifteenth century, Ockham in the fourteenth, perhaps even to Gratian in the twelfth (Brett 1997, Tierney 1997). The second and related trend has been to establish that terms referring to active rights (what we would call privilege-rights and power-rights) predate terms referring to passive rights (what we would call claim-rights and immunity-rights). It appears that the earliest debates using recognizably modern rights-language concerned topics such as whether the pope has a (power-) right to rule an earthly empire, and whether the poor have a (privilege-) right to take what they need from the surplus of the rich. Most rights entitle their holders to freedom in some sense; indeed holding a right can entail that one is free in one or more of a variety of senses. In the most general terms, the active incidents—the privilege and the power—entitle their holders to freedom to act in certain ways. The passive incidents—the claim and the immunity—often entitle their holders to freedom from undesirable actions or states. We can be more specific. A privilege-right makes it holder “free to” in the sense of non-forbiddenness. A government employee with a security clearance, for instance, has a privilege-right that makes him free to read classified documents. One can be free in this non-forbidden way without having the physical ability to do what one is free to do. You may be free to march in the parade, even when both your knees are sprained. The actions you are free to do in this sense may or may not be possible for you, but at least they are not disallowed. Someone who has a pair of privilege rights—no duty to perform the action, no duty not to perform the action—is free in an additional sense of having discretion over whether to perform the action or not. You are free to tie your left shoe first, or not, as you like. This dual non-forbiddenness again does not imply physical ability. A rightholder may be allowed to perform or not perform some action, but this still does not mean that she is capable of performing the action that she is free to perform. In contrast, the holder of a power-right does have an ability. This is the normative ability to exercise authority in a certain way. (Sumner 1987, 28) This normative ability confers freedom in a different sense. A judge is free to sentence a convicted criminal to prison. The judge is not merely allowed to sentence the prisoner: her power-right gives her the ability—that is, the authority—to do so. Her (power-) right makes her free to sentence in a way that non-judges are not free to sentence. As for the passive rights, many claim-rights entitle their holders to be free from the physical interference or surveillance of others. Other claim-rights entitle their holders to be free from undesirable conditions like hunger or fear. Immunity-rights parallel claim-rights one level up. Immunity-rights make their holders free from the authority of others, and so entitle their holders to be free from conditions like tyranny or exploitation. A legal system can be seen as a distribution of all of these varieties of freedom. Any legal system will set out rules specifying who is free to act in which ways, and who should be free from the unwanted actions of others. A developed legal system will also determine who has the authority (and so who is free) to interpret and enforce these rules. More generally, a political constitution can be seen as a multi-leveled structure of rights that distributes authority over rules of conduct in a distinctive way. A democratic constitution, for example, may give voters the power to elect legislators, who have certain powers to enact laws, which the judiciary has certain powers to interpret, and the police have certain powers to enforce, leaving certain courses of conduct open as legal for citizens to pursue. The facts about who should be free to do what within any legal or political system, as well as the facts about who should be free from which actions and conditions, can be represented as a complex, layered structure of rights. Dworkin's metaphor suggests that rights trump non-right objectives, such as increasing national wealth. What of the priority of one right with respect to another? We can keep to the trumps metaphor while recognizing that some rights have a higher priority than others. Within the trump suit, a jack still beats a seven or a three. Your right of way at a flashing yellow light has priority over the right of way of the driver facing a flashing red; and the right of way of an ambulance with sirens on trumps you both. This metaphor of trumps leads naturally to the question of whether there is any right that has priority to absolutely all other normative considerations: whether there is an “ace of rights.” Gewirth (1981) asserts that there is at least one such absolute right: the right of all persons not to be made the victim of a homicidal project. For such a right to be absolute it would have to trump every other consideration whatsoever: other rights, economic efficiency, saving lives, everything. Not all would agree with Gewirth that even this very powerful right overrides every conceivable normative concern. Some would think it might be justifiable to infringe even this right were this somehow necessary, for example, to prevent the deaths of a great many people. If it is permissible to kill one in order to save a billion, then not even Gewirth's right is absolute. Most theorists would agree that A's claim-right gives B what Raz (1975, 35–48) calls an exclusionary reason: a second-order reason not to act on some first-order reason. Dworkin's trumping metaphor makes it tempting to characterize the normative force of rights in the stronger terms of conclusive reasons. We could indeed attempt to define the Hohfeldian incidents in these terms. A's having a claim-right that B φ would imply that B has a conclusive reason to φ, and A's having a privilege-right to φ would imply that A has no conclusive reason not to φ. Powers and immunities would then determine the ways in which agents were and were not able to alter the patterns of conclusive reasons in the world. Were we to go this route, we would need to temper the “conclusiveness” of the conclusive reasons implied by rights assertions to accommodate the facts that some rights have priority to others, and that few if any rights outweigh absolutely all non-right considerations in all circumstances. If we associate rights with conclusive reasons, then for at least most rights these reasons can only be conclusive with respect to some but not all competing considerations. The test of specificationism is how convincingly it can explain what occurs when rights appear to conflict. Rights often appear to conflict. (Sinnott-Armstrong 1996; Kamm 2007, 262-301) For example, on a certain day it may seem that the public's right to protest is conflicting with the government's right to keep order on public property. When confronted with a case like this one, we will judge that one or the other (say, the public's) right should prevail. However, we do not believe that one of these rights is always stronger than the other. Given different circumstances, our judgment might favor the other (in this case, the government's) right. When rights appear to conflict like this, the usefulness of the image of rights as trumps begins to dim. Both of these rights are trump cards, yet it does not appear that one right always trumps the other. Feinberg (1980, 221–51) and Thomson (1990, 82–104) object to this specificationist view of rights. First, fully specified rights would be unknowable: no one could set out all of the qualifications that define even the simplest right. Second, rights so understood lose their explanatory force: for the specificationist rights can only be the conclusions, not the premises, of arguments concerning which side in any dispute should prevail. Third, specificationists cannot explain the “moral residue” of a “defeated” right. For instance, consider a case in which your property right in the pie cooling on your window sill conflicts with John's right to do what he must do to keep from starving. John's right may prevail in this case: John may have a right to eat your pie. Still, after John rightfully eats your pie he should apologize to you, and compensate you if he can. Thomson alleges that specificationists cannot explain the requirements that John apologizes to and compensates you, since on the specificationist view there is no right of yours that he has violated when he consumes your food. Thomson prefers the view that there really are conflicts of rights, and suggests that we should speak of a “defeated” right as being permissibly “infringed” (instead of “violated”), leaving residual obligations on the infringer. Philosophers have discussed not only how rights can conflict, but how they sometimes support one another. For example, Henry Shue has argued that both rights of security and rights of subsistence are “basic rights” because they are indispensable for the full enjoyment of all other rights—while other rights are non-basic because they are not indispensable for the enjoyment of these two. If the enjoyment or realization of a controversial right is indispensable to the enjoyment of an uncontroversial right, one can defend the controversial right by documenting its strong supporting role. Such a “linkage argument” is used by Shue to defend the right to subsistence and by Sen to link democracy and freedom of the press with preventing famines in developing countries (Shue 1996, Sen 1999). Shue's and Sen's assertions have been criticized as exaggerated (Nickel 2008, Myhrvold-Hanssen 2003 (in the Other Internet Resources)). The critics argue that making Shue's assertion about subsistence rights plausible requires two idealizations: that the assertion concerns what is necessary to achieve (1) full enjoyment of other rights (2) by all. These idealizations render Shue's linkage argument less relevant to low-income countries, which tend to be far from achieving the full realization of rights for all. Nickel (2008) develops a typology of supporting relations between rights. One right strongly supports another when it is logically or practically inconsistent to endorse the implementation of second right without endorsing the simultaneous implementation of the first. For example, the right to bodily security strongly supports the right to freedom of assembly. One right weakly supports another when it is useful but not essential to it. The right to education, for example, weakly supports the right to a fair trial. Nickel argues that the strength of supporting relations between rights varies with quality of implementation. Poorly implemented rights provide little support to other rights, while ones that are more effectively implemented tend to provide greater support to other rights. The right to due process supports the right to equal treatment for members of different racial and ethnic groups—but the support will be soft if the right to due process is only weakly implemented. Rights that weakly support each other are interdependent. Rights that strongly support each other are indivisible. Beginning with the 1968 Proclamation of Teheran the United Nations has promoted the idea that “Since human rights and fundamental freedoms are indivisible, the full realization of civil and political rights without the enjoyment of economic, social and cultural rights is impossible.” Nickel holds that this indivisibility thesis exaggerates the density and strength of supporting relations among human rights. He allows, however, that many supporting relations exist between rights—particularly under high-quality implementation—and endorses the use of linkage arguments when indispensability can be shown. There are two readings of rights to do wrong. The first reading characterizes most rights as furthering the holder's autonomy. Rights entitle their holders to make choices, and as Waldron says the importance of a person's having choices would be diminished if she were forced to do the right thing. Even though the person has no (privilege-) right to perform an action that is wrong, it would nevertheless violate an important (claim-) right of hers for others to compel her not to do that thing. To take the speech example, we respect the autonomy of speakers when we allow them to speak unmolested—even when they do wrong by expressing themselves in disrespectful ways. The second reading of rights to do wrong sees them as involving a mid-sentence shift in domains of reasons. There is no mystery, after all, in having a legal right to do something morally wrong. The potential for a legal right to do a moral wrong arises from the fact that the domains of legal and moral reasons are not perfectly overlapped. One has a legal privilege to edge in front of the tired mother in the check-out line, but this is something that one has a moral duty not to do. Similarly, one might have a moral privilege to do what one has no customary privilege to do (a moral right to do a customary wrong), and so on. Each domain of reasons is distinct, and however conclusive are the reasons that any particular rights-assertion implies, these are only reasons within a single domain of reasons (moral, or legal, or customary). Moral rights, legal rights, and customary rights all define domains of rights within the realm of rights of conduct: rights concerning how agents should act. When our reasons within these three different domains conflict, we may have reasons of different kinds to act in different ways. Yet there are also rights entirely beyond the realm of conduct. These are rights to believe, to feel and to want. For example, the prime minister asserts that he had a right to believe what his advisors told him. The artist says she has a right to feel angry at her critics. The frustrated suburbanite complains he has a right to want more out of life. The realm of rights of rights to believe, to feel and to want are the realms of epistemic, of affective, and of conative rights. Together with the realm of rights of conduct, these are the four realms of rights. Each of these four realms of rights defines a separate conceptual space: there are no epistemic rights to act, and no affective rights to believe. What is distinctive about the three realms of rights beyond the rights of conduct is that they contain only privilege-rights (Wenar 2003). One may, for example, have a privilege-right to believe what one's eyes tell one, and a privilege-right to feel proud of what one has done. It is interesting to consider why these epistemic, affective, and conative realms contain no claims, powers, or immunities. Philosophers have long been interested in epistemic rights in particular. William James, for instance, calls The Will to Believe, “an essay in justification of faith, a defense of our right to adopt a believing attitude in religious matters, in spite of the fact that our merely logical intellect may not have been coerced.” James's “radical” conclusion in the essay is that “we have the right to believe at our own risk any hypothesis that is live enough to tempt our will.” (James 1897, 2, 29) Similarly the deepest questions in Kant's philosophy are framed in terms of rights. In the Critique of Pure Reason the Transcendental Deduction of the Categories aims to prove the validity of the employment of the concepts of pure understanding. In the Critique of Practical Reason the Deduction of Freedom aims to demonstrate our entitlement to regard ourselves as free. In both Deductions the central question is a quaestio iuris: “By what right?” Kant's questions are: By what right do we employ the categories; and by what right do we think of ourselves as free? There are two leading philosophical approaches to explaining which fundamental rights of conduct there are, and why these rights should be respected. These two approaches are broadly identifiable as deontological and consequentialist. Status theories hold that human beings have attributes that make it fitting to ascribe certain rights to them, and make respect for these rights appropriate. Instrumental theories hold that respect for particular rights is a means for bringing about some optimal distribution of interests. Each approach has characteristic strengths and weaknesses; the long-running contest between them is ongoing. A person is constituted by his body and his mind. They are parts or aspects of him. For that very reason, it is fitting that he have primary say over what may be done to them—not because such an arrangement best promotes overall human welfare, but because any arrangement that denied him that say would be a grave indignity. In giving him this authority, morality recognizes his existence as an individual with ends of his own—an independent being. Since that is what he is, he deserves this recognition. Quinn claims that there is some attribute of the person—here, being “an individual with ends of his own”—that merits recognition from others. The recognition that is due to each individual can be accorded to that individual by respecting his fundamental rights. Quinn contrasts his status approach to rights with one that ascribes rights “because such an arrangement best promotes overall human welfare.” His target is consequentialist theories of rights, the paradigm of which are utilitarian theories. We met such a utilitarian theory of rights above in John Stuart Mill's conceptualization of rights as “something which society ought to defend me in the possession of.” Mill believed that society ought to defend the individual in possession of her rights because doing so would bring about the greatest aggregate utility summed across the members of that society. For Mill, as for other instrumental theorists, rights are a tool for producing an optimal distribution of interests across some group. It is not that we think it fitting to ascribe rights because we think it is a good thing that rights be respected. Rather we think respect for rights a good thing precisely because we think people actually have them—and… that they have them because it is fitting that they should. Within a status approach rights are not means for the promotion of good consequences. They are rather, in Nozick's phrase, side constraints on the pursuit of good consequences. (Nozick 1974, 29) A status approach frowns on any rights violation, even for the sake of maximizing the non-violation of rights overall (as in a “utilitarianism of rights”). Such an approach emphasizes the “agent-relative” reasons that each person has to avoid violating the rights of others. A status-based justification thus begins with the nature of the rightholder and arrives immediately at the right. The instrumental approach starts with the desired consequences (like maximum utility) and works backward to see which rights-ascriptions will produce those consequences. Status theories belong to the tradition of natural rights theories. All natural rights theories fix upon features that humans have by their nature, and which make respect for certain rights appropriate. The theories differ over precisely which attributes of humans give rise to rights, although non-religious theories tend to fix upon the same sorts of attributes described in more or less metaphysical or moralized terms: free will, rationality, autonomy, the ability to regulate one's life in accordance with one's chosen conception of the good life. Natural rights theorists agree that human reason can grasp the fact that it is appropriate to treat beings with such attributes in certain ways, although they disagree on whether such facts are self-evident. The right to speak may simply be the only appropriate way to treat people with minds of their own and the capacity to use means to express it... Not recognizing a person's option of speaking is to fail to respect him... To say that any given person is not entitled to the strong right to free speech is... a way of saying that certain crucial features of human nature are not sufficient to generate the right in anyone. And this seems to be a mistake. Moreover, status-based rights are attractively robust. While the justifications of instrumental rights are always contingent on calculations concerning consequences, status-based rights are anchored firmly in individual dignity. This makes it easy to explain why status-based rights are strong, almost unqualified rights, and this is a position which many believe properly expresses the great value of each person. However, the strength of status-based rights can also be seen as a weakness of the theory. One does not wish to be carried from the great importance of each individual to the implausible position that all fundamental rights are absolute. As Nagel (2002, 36) allows while defending a status view, “there are evils great enough so that one would be justified in murdering or torturing an innocent person to prevent them.” Consequences, if bad enough, do justify the qualification of individual rights, which leaves the status theorist needing to explain how a theory which rejects consequences so resolutely at the outset can concede their importance later on. Moreover, the simplicity of the status approach to rights can also appear to be a liability. On close examination, the fundamental rights that most people believe in are intricately “shaped.” For example, consider the widely-accepted right to free expression. This right includes the right to make damning personal attacks on others. Yet the right is much more permissive about attacking public figures than it is about assailing private citizens. How could a status approach explain this distinction between public figures and private citizens? Or again: the right to free speech contains a right to say what the speaker knows to be untrue. Yet we tend to be more tolerant of deceitful speech in political campaigns than we are of deceitful speech in advertising or in the courtroom. It is an open question whether status theory has the conceptual resources to explain why individual rights should be shaped in these specific ways. Instrumental theories describe rights as instruments for achieving an optimal distribution of interests. The archetypal instrumental theory is some form of two-level consequentialism, such as rule utilitarianism. Within such a theory rights are rules, the general observance of which will lead to an optimal distribution of interests. In rule utilitarianism the optimal distribution is the one that contains the greatest aggregate utility. Weak rights are a problem for utilitarianism because its focus on maximization makes it indifferent to certain facts about how utility is distributed across individuals. However, utilitarianism is not the only kind of instrumental theory. Instrumental theories differ over how they define what counts as an optimal distribution (maximization, equality, etc.). They also differ in how they measure individual interests. For instance, a utilitarian's metric for interests is utility, Sen works with a metric of capabilities, Dworkin with resources, and so on. Status theories are subject to the objection that they lack the conceptual resources to explain why the rights we believe in are intricately “shaped” to accommodate the particularities of different contexts and different rightholders. Instrumental theories are vulnerable to the mirror-image objection. An instrumental theorist can appeal to any number of distinct interests, which are at stake for any number of differently-situated individuals, to explain why a certain right should be held only by certain persons or only in certain circumstances. The danger for such a theorist is that the wealth of normative resources at her command will permit the ascription of whatever rights she favors. The theorist begins with the rights that she wants to justify, then gives a “just so” story in terms of an optimal distribution of interests that leads to exactly those rights. (Tushnet 1984, Frey 1985) Moreover all instrumental justifications rely on empirical predictions concerning which ascriptions of rights would produce which consequences, and there will typically be enough slack in these empirical predictions for instrumental theorists to fudge their derivations in order to reach the desired rights. A third approach to the justification of rights might be called “contractual.” Here rights are characterized neither as naturally fitting for independent beings, nor as tools to promote the best state of affairs. Rather, rights define principles that would be chosen by properly situated and motivated agents agreeing to the basic terms of their relations (e.g., principles chosen in Rawls's original position, or principles within Scanlon's contractualism that no one could reasonably reject). The fact that these principles would be agreed to under the specified conditions is their justification. Rights define fundamental principles within these theories because of the close connection between rights and what the theories' agents have strong reason to want. So, for example, Rawls states that the role of the right of personal property “is to allow a sufficient material basis for a sense of personal independence and self-respect, both of which are essential for the development and exercise of the two moral powers.” (Rawls 1993, 298) And Scanlon says that reasonable individuals “have reason to insist... on basic rights, which give them important forms of protection and control over their own lives.” (Scanlon 2003, 4) This third, contractual approach to the justification of rights has received surprisingly little scholarly attention (Martin, 1985, Gilbert 2004). The right of property, Marx asserted, exemplifies the isolating and anti-social character of these alleged rights of man. On the one hand, the right of property is the right to keep others at a distance: the legal equivalent of a barbed wire fence. On the other hand, the right of property allows an owner to transfer his resources at his own pleasure and for his own gain, without regard even for the desperate need for those resources elsewhere. Similarly, Marx held that the much-celebrated individual right to liberty reinforces selfishness. Those who are ascribed the right to do what they wish so long as they do not hurt others will perpetuate a culture of egoistic obsession. As for equality, the achievement of equal rights in a liberal state merely distracts people from noticing that their equality is purely formal: a society with formally equal rights will continue to be divided by huge inequalities in economic and political power. Finally, these so-called “natural” rights are in fact not natural to humans at all. They are simply the defining elements of the rules of the modern mode of production, perfectly suited to fit each individual into the capitalist machine. Communitarians (Taylor, Walzer, MacIntyre, Sandel) sound several of the same themes in their criticisms of contemporary liberal and libertarian theories. The communitarians object that humans are not, as such theories assume, “antecedently individuated.” Nozick's “state of nature” theorizing, for example, errs in presuming that individuals outside of a stable, state-governed social order will develop the autonomous capacities that make them deserving of rights. Nor should we attempt, as in Rawls's original position, to base an argument for rights on what individuals would choose in abstraction from their particular identities and community attachments. There is no way to establish a substantive political theory on what all rational agents want in the abstract. Rather, theorists should look at the particular social contexts in which real people live their lives, and to the meanings that specific goods carry within different cultures. This criticism continues by accusing liberal and libertarian theories of being falsely universalistic, in insisting that all societies should bend themselves to fit within a standard-sized cage of rights. Insofar as we should admit rights into our understanding of the world at all, communitarians say, we should see them as part of ongoing practices of social self-interpretation and negotiation— and so as rules that can vary significantly between cultures. As we saw above, the language of rights is able to accommodate rightholders who are individuals as such, but also individuals considered as members of groups, as well as groups themselves, states, peoples, and so on. Indeed the non-individualistic potential of rights-language is more than a formal possibility. The doctrine of international human rights—the modern cousin of eighteenth century natural rights theory—ascribes several significant rights to groups. The international Convention against Genocide, for example, forbids actions intending to destroy any national, ethnic, racial or religious group; and both of the human rights Covenants ascribe to peoples the right to self-determination. Such examples show that the language of rights is not individualistic in its essence. Our rights talk, in its absoluteness promotes unrealistic expectations, heightens social conflict, and inhibits dialogue that might lead toward consensus, accommodation, or at least the discovery of common ground. In its silence concerning responsibilities, it seems to condone acceptance of the benefits of living in a democratic social welfare state, without accepting the corresponding personal and civic obligations…. In its insularity, it shuts out potentially important aids to the process of self-correcting learning. All of these traits promote mere assertion over reason-giving. It is not inevitable that these unfortunate tendencies will afflict those who make use of the language of rights. As we have seen, it may be plausible to hold that each right is “absolute” only within a elaborately gerrymandered area. And it may be possible to produce deep theories to justify why one has the rights that one asserts. However, it is plausible that the actual use of rights talk does have the propensities that Glendon suggests. It seems no accident that America, “the land of rights,” is also the land of litigation. Another deleterious consequence of rights talk that Glendon picks out is its tendency to move the moral focus toward persons as rightholders, instead of toward persons as bearers of responsibilities. This critique is developed by O'Neill (1996, 127–53; 2002, 27–34). A focus on rightholders steers moral reasoning toward the perspective of recipience, instead of toward the traditional active ethical questions of what one ought to do and how one ought to live. Rights talk also leads those who use it to neglect important virtues such as courage and beneficence, which are duties to which no rights correspond. Finally, the use of rights language encourages people to make impractical demands, since one can assert a right without attending to the desirability or even the possibility of burdening others with the corresponding obligations. Criticisms such as O'Neill's do not target the language of rights as a whole. They aim squarely at the passive rights, and especially at claim-rights, instead of at the active privileges and powers. Nevertheless, it is again plausible that the spread of rights talk has encouraged the tendencies that these criticisms suggest. The modern discourse of rights is characteristically deployed by those who see themselves or others as potential recipients, entitled to insist on certain benefits or protections. Describing fundamental norms in terms of rights has benefits as well as dangers. The language of rights can give clear expression to elaborate structures of freedom and authority. When embodied in particular doctrines, such as in the international human rights documents, the language of rights can express in accessible terms the standards for minimally acceptable treatment that individuals can demand from those with power over them. Rights are also associated with historical movements for greater liberty and equality, so assertions of rights in pursuit of justice can carry a resonance that other appeals lack. Whether these benefits of using rights language overbalance the dangers remains a live question in moral, political and legal theory. Bentham, J., 1796, Anarchical Fallacies, in Waldron 1987a, pp. 46–76. Brett, A., 1997, Liberty, Right, and Nature, Cambridge: Cambridge University Press. Campbell, T., 2006, Rights: A Critical Introduction, London: Routledge. Cruft, R., 2004, “Rights: Beyond Interest Theory and Will Theory?”, Law and Philosophy, 23: 347–97. Darwall, S., 2006, The Second-Person Standpoint, Cambridge: Harvard University Press. Dworkin, R., 1984, “Rights as Trumps”, in Waldron 1984, pp. 153–67. Edmundson, W., 2004, An Introduction to Rights, Cambridge: Cambridge University Press. Feinberg, J., 1970, “The Nature and Value of Rights”, Journal of Value Inquiry, 4: 243–257. –––, 1973, Social Philosophy, Englewood Cliffs, NJ: Prentice-Hall. –––, 1980, Rights, Justice, and the Bounds of Liberty, Princeton: Princeton University Press. Finnis, J., 1980, Natural Law and Natural Right, Oxford: Clarendon Press. Frey R., 1985, “Act-Utilitarianism, Consequentialism, and Moral Rights”, in Frey, R, (ed. ), Utility and Rights, Oxford, Basil Blackwell, pp. 61–85. Gewirth, A., 1981, “Are There any Absolute Rights?”, in Waldron 1984, pp. 81–109. Gilbert, M., 2004, “Scanlon on Promissory Obligation: The Problem of Promisees' Rights”, The Journal of Philosophy, 101: 83–109. Gilligan, C., 1993, In a Different Voice, Cambridge: Harvard University Press. Glendon, M., 1991, Rights Talk: The Impoverishment of Political Discourse, New York: Free Press. Griffin, J., 1989, Well-Being: Its Meaning, Measurement, and Moral Importance, Oxford: Oxford University Press. Gutmann, A., 1985, “Communitarian Critics of Liberalism”, Philosophy and Public Affairs, 14: 308–322. Hart, H., 1961, The Concept of Law, Oxford: Oxford University Press. –––, 1982, Essays on Bentham: Studies in Jurisprudence and Political Theory, Oxford: Clarendon Press. Holmes, S., and Sunstein, S., 1999, The Costs of Rights, New York: W.W. Norton. Ignatieff, M., 2003, “Human Rights, Sovereignty, and Intervention”, in Owen, N. (ed.) Human Rights and Human Wrongs: The Oxford Amnesty Lectures 2001, Oxford: Oxford University Press. Ivison, D., 2007, Rights, Montreal: McGill-Queen's University Press. James, W., 1897 The Will to Believe; page references in the text are to W. James, The Will to Believe and Human Immortality, New York: Dover, 1956. Jones, P., 1994, Rights, New York: St. Martin's Press. Kamm, F., 1992, “Non-Consequentialism, the Person as an End-in-Itself, and the Significance of Status”, Philosophy and Public Affairs, 21: 354–89. –––, 2007, Intricate Ethics, Oxford: Oxford University Press. Kramer, M., 2001, “Getting Rights Right”, in Rights, Wrongs, and Responsibilities, ed. Kramer. M., London: Macmillan, pp. 28–95. Kramer, M., Simmonds, N., and Steiner, H., 1998, A Debate Over Rights, Oxford: Oxford University Press. Louden, R., 1983, “Rights Infatuation and the Impoverishment of Moral Theory”, Journal of Value Inquiry, 17: 87–102. Lyons, D., 1970, “The Correlativity of Rights and Duties”, Noûs, 4: 45–57. MacCormick, N., 1977, “Rights in Legislation”, in Hacker, P., and Raz, J. (eds. ), Law, Morality and Society: Essays in Honour of H.L.A Hart, Oxford: Oxford University Press, 1977, pp. 189–209. –––, 1982, Legal Right and Social Democracy, Oxford: Oxford University Press. Mackie, J., 1979, “Can There be a Rights-Based Moral Theory?”, in Waldron 1984, pp. 168–81. Martin, R., 1993, A System of Rights, Oxford: Oxford University Press. –––, 1985, Rawls and Rights, Lawrence, Kansas: University Press of Kansas. Marx, K., 1844, “On the Jewish Question”; page reference in the text is to the reprint in Waldron 1987a, pp. 137–50. Mill, J., 1859, On Liberty; page reference in the text is to the reprint in J. Mill, On Liberty and Other Essays, S. Collini (ed. ), Cambridge: Cambridge University Press, 1989. –––, 1861, Utilitarianism; page reference in the text is to the reprint in J. Mill, Utilitarianism, G. Sher (ed. ), Indianapolis: Hackett, 2002. Mulhall, S., and Swift, A., 1992, Liberals and Communitarians, Oxford: Blackwell. Nagel, T., 2002, Concealment and Exposure, Oxford: Oxford University Press. Narveson, J., 2001, The Libertarian Idea, Peterborough, Ontario: Broadview. –––, 2002, A Question of Trust, Cambridge: Cambridge University Press. Nickel, J., 2008, “Rethinking Indivisibility: Towards a Theory of Supporting Relations between Human Rights”, Human Rights Quarterly 30: 984–1001. O'Neill, O., 1996, Toward Justice and Virtue: A Constructive Account of Practical Reasoning, Cambridge: Cambridge University Press. Pettit, P., 1988, “The Consequentialist can Recognize Rights”, Philosophical Quarterly, 38: 42–55. Plamenatz, J., 1938, Consent, Freedom, and Political Obligation, Oxford: Oxford University Press. Quinn, W., 1993, Morality and Action, Cambridge, Cambridge University Press. Rainbolt, G., 2006, The Concept of Rights, Dordrecht: Springer. Rawls, J., 1971, A Theory of Justice, Cambridge: Harvard University Press. Raz, J., 1975, Practical Reason and Norms, London: Hutchinson. –––, 1986, The Morality of Freedom, Oxford: Oxford University Press. –––, 1994, Ethics in the Public Domain, Oxford: Oxford University Press. Sandel, M., 1982, Liberalism and the Limits of Justice, Cambridge: Cambridge University Press. Scanlon, T., 1977, “Rights, Goals, and Fairness”, in Waldron 1984, pp. 137–52. Schauer, F., 1984, “Can Rights Be Abused?”, Philosophical Quarterly, 31: 225–30. Sen, A., 1982, “Rights and Agency”, Philosophy and Public Affairs, 11: 3–39. Sen, A., 1999, Development as Freedom, Oxford: Oxford University Press. Shafer-Landau, R., 1995, “Specifying Absolute Rights”, Arizona Law Review, 37: 209–24. Shapiro, I., 1986, The Evolution of Rights in Liberal Theory: An Essay in Critical Theory, Cambridge: Cambridge University Press. Shue, H., 1996, Basic Rights: Subsistence, Affluence, and U.S. Foreign Policy, Princeton: Princeton University Press. Sinnott-Armstrong, W., 1996, “Moral Dilemmas and Rights”, in Mason, H. E. (ed. ), Moral Dilemmas and Moral Theory, New York: Oxford University Press, pp. 48–65. Skorupski, J., 2010, The Domain of Reasons, Oxford: Oxford University Press. Sreenivasan, G., 2005, “A Hybrid Theory of Claim-Rights”, Oxford Journal of Legal Studies 25: 257–74. –––, 2010, “Duties and Their Direction”, Ethics, 120 (3): 465–494. Steiner, H., 1994, An Essay on Rights, Oxford, Blackwell. Sumner, L., 1987, The Moral Foundations of Rights, Oxford: Oxford University Press. Taylor, C., 1979, “Atomism”, in Kontos, A., (ed. ), Powers, Possessions, and Freedom, Toronto: University of Toronto Press. Thompson, M., 2004, “What is It to Wrong Someone? A Puzzle About Justice”, in Wallace, R. J., Pettit, P., Scheffler, S., and Smith, M. (eds. ), Reason and Value: Themes from the Moral Philosophy of Joseph Raz, Oxford: Clarendon. Tierney, B., 1997, The Idea of Natural Rights, Atlanta: Scholars Press. Tushnet, M., 1984, “An Essay on Rights”, Texas Law Review, 62: 1363–1403. Vallentyne, P., and Steiner, H., 2000, Left Libertarianism and its Critics: The Contemporary Debate, New York: Palgrave Macmillan. Waldron, J., (ed. ), 1984, Theories of Rights, Oxford: Oxford University Press. –––, (ed. ), 1987a, Nonsense Upon Stilts: Bentham, Burke, and Marx on the Rights of Man, London: Methuen. –––, 1987b, “Nonsense Upon Stilts?—A Reply”, in Waldron 1987a, pp. 151–209. –––, 1993, Liberal Rights: Collected Papers 1981–1991, Cambridge: Cambridge University Press. Wellman, C., 1985, A Theory of Rights, Totowa, NJ: Rowman & Allanheld. –––, 1995, Real Rights, Oxford: Oxford University Press. –––, 1997, An Approach to Rights, Dordrecht: Kluwer. Wenar, L., 2003, “Legal Rights and Epistemic Rights”, Analysis, 63: 142–46. –––, 2005, “The Nature of Rights”, Philosophy and Public Affairs, 33: 223–53. –––, 2008, “The Analysis of Rights”, in Kramer, M., Grant, C., Colburn, B., and Hatzistavrou, A. (eds. ), The Legacy of H. L. A. Hart, Oxford: Oxford University Press, pp. 251–73. Williams, G., 1968, “The Concept of a Legal Liberty”, in Summers, R. (ed. ), Essays in Legal Philosophy, Oxford: Blackwell, pp. 121–44. Myhrvold-Hanssen, T., 2003, “Democracy, News Media, and Famine Prevention: Amartya Sen and the Bihar Famine of 1966–67,” published at disasterdiplomacy.org.